We believe you work hard enough. At Kargo Master we want to make your job easier – especially when challenges arise. Since the 1970s we have listened to your wants and needs. Our hallmark is to provide the best in truck and commercial van ladder racks, equipment, and accessories. We offer streamlined styling without compromising strength or security. Materials like T-6 aircraft aluminum, swaged joints, and polyester marine-grade powder coating keep our products strong, durable, and long-lasting for years. We offer our customers many options to meet their needs. 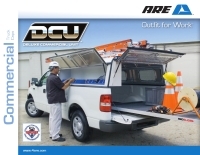 We employ the highest technology to manufacture all of our custom Kargo Master truck racks and van racks. Our product lines include both commercial and personal grade rack systems. Our systems include truck racks, ladder racks, van shelving, lumber racks, and van roof racks to name a few. All of the Kargo Master rack systems are built by our excellent staff using state-of-the-art computerized equipment and stringent quality control systems. Our truck racks, ladder racks, van shelving, lumber racks, and van roof racks are the best in the industry. After 40 years of engineering truck ladder racks, we are proud to introduce our Commercial Van Equipment line of products. From highly engineered ladder rack systems to fully welded interior van shelving, we've raised the standard in quality and craftsmanship. We also offer multiple van organizational packages.